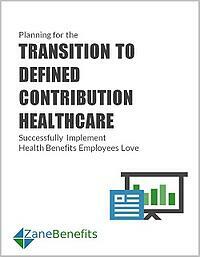 Zane Benefits, the #1 Online Health Benefits Solution, announced today the publication of a free eBook "Planning for the Transition to Defined Contribution Healthcare." The new eBook helps companies, and their brokers, successfully implement a health plan that creates happier employees, reduces costs, and frees up time for meaningful work. According to Zane Benefits, industry experts and economists agree that defined contribution healthcare is not only on the rise, but that defined contribution is the future of how employers will offer health benefits (source). As companies rapidly transition to defined contribution, it is important to set goals, implement the plan, and educate employees. According to Zane Benefits, these steps set the foundation for health benefits both the company and employees love. Defined contribution is a simple and effective approach to healthcare that helps companies recruit and retain top talent -- without the cost and complication of traditional employer health insurance. Small business owners, non-profits, CEOs, CFOs, HR managers, accountants, and insurance professionals should download this guide for a road map on how to transition to defined contribution healthcare.